Illustrate the interconnections between anatomy and physiology using a concept map. Anatomy Mind Mapping - Click on the various parts of the map for further explanations. Body Systems - Mapping out the body systems and their functions. Fill in the blanks with the correct words from the word bank to complete the map. Five main types of organizers - Links showing examples of many types. Mind-Mapping Anatomy - Various visual maps illustrating the overall human anatomy and physiology. Ways to Learn Anatomy and Physiology - Numerous methods of mapping, drawing and visualizing the anatomy. Sequence the levels of structural organization from the molecular level through the organismic level. Levels of Organization - Powerpoint slides on the physiology and structural organization of the body. Organization of the Body - Describes the entire organization of not only the body but the body tissue as well. 7 Levels of Organization - Explanations of each level. Use prepared slides to distinguish among different types of tissues. Bone and Cartilage Tissue - Skeletal system framework and the tissues it encompasses. How are Tissues Classified? - Inquiry investigation where students observe slides of unknown tissues and work in groups to develop unique classification schemes for the tissues and then compare those to the classification scheme in their book. Images of Tissue - Click on the tissue type to see a color gif image. Tissues - The study and classification of tissues. Classify organ systems of the body as either (1) protection, support, and movement, (2) regulation and integration (3) transport, and (4) absorption and excretion. Basic Anatomy: Tissues and Organs - Pictures of each organ system with details regarding the role and function. Body Systems and Homeostasis - Summaries of how the body's systems function and mentions various regulatory mechanisms that allow each system to contribute to homeostasis. Human Organ Systems - 'Rags to Riches' game in which answering the questions correctly gets you fame and fortune. Organ Systems of the Body - A detailed chart of each system and the classification/functions. Vertebrate Organ System - Outline of each system indicated the functions and components. 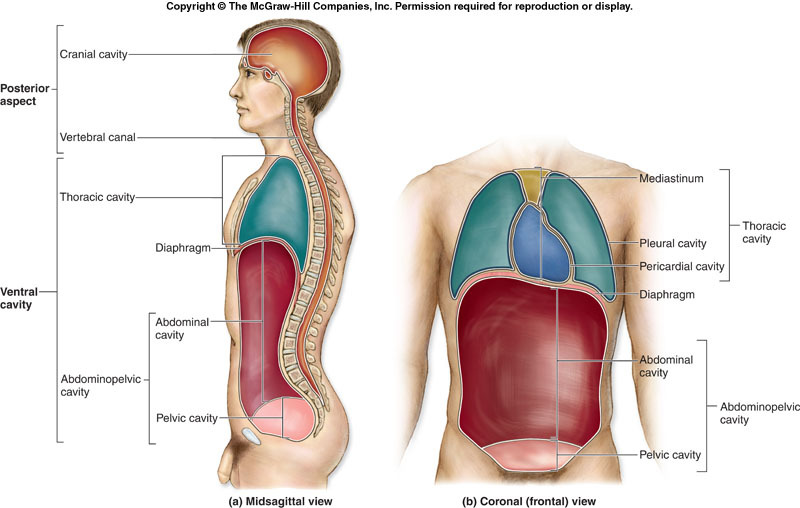 Identify the major organs and describe the functions of each body system. A Guide to Human Anatomy - Click on a body system to get tutorials and quizzes on the different major organs. Body Systems - Choose a system and move the mouse over the body to identify the different parts. Human Anatomy and Physiology Lessons - Lesson plans on the various body systems and what they entail. Human Anatomy Systems - Variety of slides, activities, graphic organizers and more to learn the body systems and major organs. Identify and label the body cavities including the subdivisions and organs of each. Body Cavities Quiz - Match-up quiz with a time limit of 30 seconds to complete it. Body Cavity Labeling - Print out and label the various parts on the diagram. The answers can be found here. Body Organization and Terminology - Lab exercise that includes locating and naming the body cavities as well as identifying the organs and membranes associated with each. Body Planes, Directions and Cavities - Classroom activities including coloring pages of the body cavities. Body Regions and Major Body Cavities - Lab activities describing the body and major body cavities and organs found in each. Organ Systems - Interactive activity. Help Arnold get his missing organs from the major body systems. The Human Body - PowerPoint detailing the anatomical regions, directions and body cavities. Apply correct terminology to reference anatomical orientation. Glossary of Anatomy Terminology - Alphabetical listing of terms that provide the origin and definition related to muscles. Anatomical Terminology - from Dr. A. Ebneshahidi. Body Structure Terms - Defines groups of body structures in relation to their location on the body. Arnold's Glossary of Anatomy - Word search engine of anatomical terms. The Anatomy Lesson - A student's first exposure to terminology used by Anatomists by Wesley Normal, PhD, DSc. Terms for Body Regions - Identifies various regions of the human body through interactive exercises. Terminology of the Body - PowerPoint describing the various parts of the body with visuals to go along. Provide examples of bodily mechanisms that serve to maintain homeostasis. Feedback Mechanisms - Concept maps, diagrams and examples on maintaining equilibrium with feedback mechanisms. Homeostasis of the Body - PowerPoint describing not only homeostasis but the body's various mechanisms that maintain it. Introduction to Homeostasis - Regulating the body with feedback mechanisms. Maintaining Homeostasis - Great outline with key points on how the body functions efficiently and is maintained by various mechanisms. Mechanisms that Regulate the Body - 5 major homeostasis mechanisms explored with activities. Negative and Positive Feedback Mechanisms - PowerPoint with detailed explanations and diagrams. Explain how the body regulates temperature, blood carbon dioxide levels, and blood glucose levels. Blood Glucose Regulation - Explanation and activity on why we need glucose to regulate the body. Biological Homeostasis - Article on the body's ability to keep its functions static. Controlling Blood Sugar Levels - Explains how the body controls blood glucose levels. Diabetes and Blood Sugar Levels - Explanation of how insulin and glycogen help regulate blood sugar levels. Homeostasis - Specific details and drawings on regulating the body to obtain homeostasis. How the Body Regulates Blood Sugar - Description and diagram of the process to maintain blood glucose levels. Introduction to Homeostasis - Regulating the body and feedback mechanisms. Regulation of Body Temperature - Explanation and activity on the importance of maintaining constant internal temperature. Regulating Body Temperature - How the body maintains a set temperature. Regulating Carbon Dioxide Levels - Explanation and activity on the regulation of gases. Skin and Body Temperature - The largest organ of your body is skin, did you know that? How skin helps regular body temperature is explained in this article. Staying Cool When Your Body Is Hot - Physiological concepts of body temperature regulation and hydration. Thermoregulation - Wikipedia explanation of thermoregulation.